MONDRAGO auf Android (Version 0.6) : Mondrago. Das Spiel. The game. El juego. El joc. Il jeu. Hi Fans! Mondrago is running on Android already. There’s an even more sophisticated Mondrago Version 0.6 around, too. → Rendering the board view to the device’s screen resolution is optimized now. → It adds check of alternating game play. → Game situations and the whole rule set is checked as well. → Stops playing as soon as a player wins. Thus game ends if the winner gets a quad (or better square) shaped by his pawns. 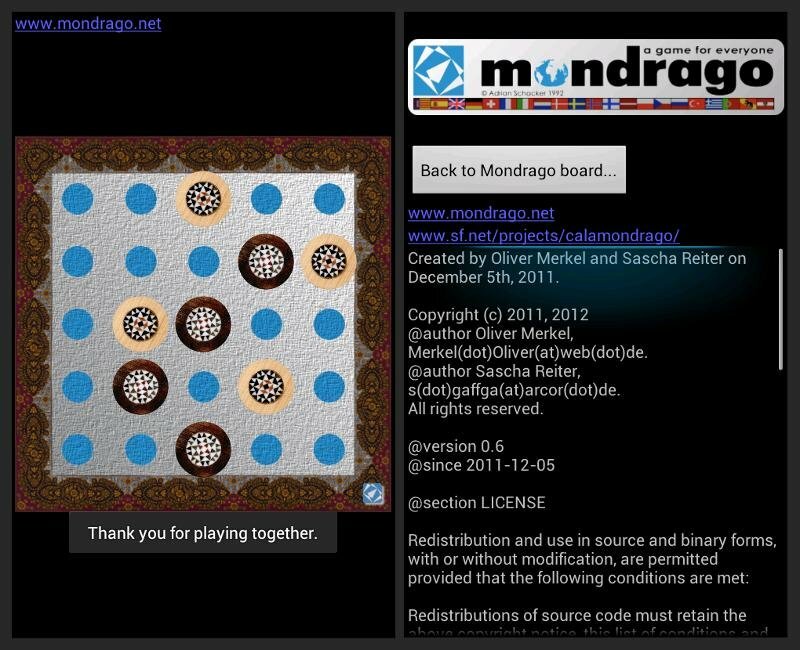 → If winning the etiquette as introduced in the Mondrago community is that the winning player says „Mondrago“ and his opponent kindly thanks for the game played. Just like our Mondrago does in this implementation. → Still no computer player in this version.